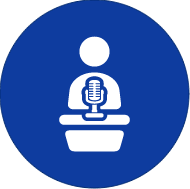 Our experienced conference and keynote speakers help you to provide an educational, informative, memorable, and often humorous experience at your next conference, away day, AGM or company meeting. Having an experienced keynote or conference speaker is a perfect way to reinforce your organisation's desire for creativity and innovation in the workplace or it can be a great way to introduce the business case to key stakeholders. Our solutions are always tailored to your requirements. 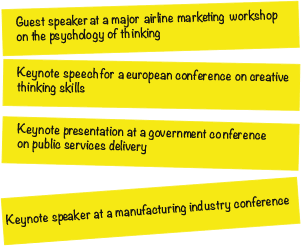 It may be that you need a Keynote Speaker for a conference, a Facilitated Meeting, a series of Workshops or an entire Organisation Wide Innovation Programme.